Grace isn’t a little prayer you chant before receiving a meal. No matter the history of the Thanksgiving holiday, it is a day that I welcome with joy. I stop for a few moments every hour thoughout the day to think thoughts of gratitude. I’ve decided to start that practice today as I set the table, clean the bath and kitchen, and finish some work…. May your moments be blessed with gratitude as well. I’m delighted that my blog is a whistle stop on an extensive blog tour for this new knitting-pattern book. Story Publishing sent me a copy of the book and I could easily see why the One-Skein Wonders series is so popular. Who doesn’t have a skein left of one thing or another? This book is an answer to the question, what can I do with this yarn? I also saw the book for sale at Atkinson Farm Yarns in Vincennes, IN. Fifteen knitters passed it from person to person, each making positive comments about the designs and clever use of yarn. My personal favorite thing about the book is that it contains three patterns by my friend, Andrea Wong. There is nothing more adorable than children’s clothes. Those soft, cozy hats, tiny jackets, and “blankies” kids can’t live without are treasures when knitted by someone who loves them. With One-Skein Wonders for Babies, an irresistibly cute collection of 101 knitting projects for outfitting infants and toddlers using one skein of yarn, knitters can make those precious items easily, sometimes even in one day! In this welcome addition to the six-volume best-selling One-Skein Wonders series, editor Judith Durant, has gathered 101 of the sweetest designs from top knitwear designers to offer every level of knitter an inviting variety of styles, including practical leg warmers, huggable stuffed animals, baby bootees, and more. Filled with colorful photos and helpful charts, the one-skein approach offers projects for all skill levels and yarn types. Perfect designs for gifts! One-Skein Wonders for Babies is the seventh book in the One-Skein Wonders series. One-Skein Wonders, 101 Designer One-Skein Wonders, Luxury Yarn One-Skein Wonders, Sock Yarn One-Skein Wonders, Crochet One-Skein Wonders, and Lace One-Skein Wonders together have over 500,000 copies in print. Judith Durant is editor of the best-selling One-Skein Wonders series, which currently includes six volumes; author of Increase, Decrease and Knit One, Bead Too; and co-author of Knitting Know-How. Durant has been knitting for more than 50 years and writing and editing for more than 30 years. She lives in Lowell, Massachusetts. I spent the summer knitting other people’s designs (something I rarely do) and I enjoyed every minute of it. This was restful, relaxing and healing. Here are snap shots of the projects I’ve completed since June. The Decapo jacket [top left], pattern by Danish designer a Hanne Falkenberg, was knit using yarn that was a “Get Well” gift from a friend of mine. (Madelinetosh sock yarn from Simply Socks Yarn Company). What a perfectly delightful way to recover. Here is a link to the first Decapo I knit with Shetland yarn from a Falkenberg kit. The Ballerina jacket [top right] was knit from a Hanne Falkenberg kit using Shetland yarn. This was one of the most interesting patterns I’ve ever knit. I have one more of her kits to knit—Profil. This designer is amazing. The Monkey socks were knit from a 2006 Knitty pattern by Cookie A. I used a silk blend from Simply Socks and these feel better than any socks I’ve worn. The shawl was designed by Rosemary (Romi) Hill, and I bought her pattern on Ravelry. The shawl is named, Artesian (like the water that bubbles up in a natural well). I used Copper Corgi marino in Stormy Marsh color. I bought the yarn at a shop in downtown Savanna, Georgia, but the link here goes to The Copper Corgi Etsy shop. The shawl turned out very “Savannah” so it is a fond memory of my trip. I consider myself recovered so now I will embark upon publishing more of my own designs on Revelry. I’m working on a collection of texture knits—mostly sweaters. and let your soul catch up with your body. The Jackson Street Pier in Sandusky must be one of the better duty stations for the Customs and Border Patrol officers. The inspections went smoothly and I got to use my new wallet-size passport card. I also added another item to my list of reasons I like being over seventy. Everyone stood back and let me go first. They didn’t see me get in my two-seated roadster to drive on home. Lake Erie has come a long way back from the brink in the past fifty years. When I saw it on my way through Cleveland in 1965, it was dead. Last week, the water was clear, and free of debris and odor. Since there has been so much rain this year, the water level was unusually high so many beaches were covered. Starting a trip with a boat ride adds to the excitement, and is a fun way to separate one from everyday life—unless, of course, one works on a boat in ones everyday life. I didn’t even feel sea sick. Knitting is an essential skill for those of us who aren’t adapted to aimless idleness. It makes us patient waiters. I knit as I waited for the boat, I knit while we traveled. I knit while my friend and I visited. Some folks don’t realize that most knitting doesn’t require constant thought so one can converse and pay attention to other things while the fingers are moving. Halfway into our voyage, the Ohio rain gave way to the first sunshine I’d seen in days. It lasted for several days. I even brought it home with me. As my friend said, Pelee Island looks like a chunk was cut out of the Ohio farm land and set down in the middle of the lake. The center of the island is planted in crops like soy beans. A morning stroll down a shaded country lane adds even more to an already excellent breakfast at the local Bakery. The baker is also a painter and jewelry maker. I invested in earrings and a tea pot as well as croissants. A trip to the local winery was educational as well as fun. Did you know that rose bushes are planted at the end of each row of grape vines for their “canary in the mine” effect? The same diseases infest the roses as the grapes so, if the roses show disease, the whole row is likely to be involved. The history museum, the local craft co-op, a food and hardware co-op, and a small dress shop also grabbed my attention. I didn’t put too big a dent in my budget, but I did bring home good-memory triggers. Some folks call these souvenirs. As I drove west toward home on U.S. 6, and U.S. 27, I felt whole. I think that is what vacations are for. Last evening, there was a spontaneous gathering of my neighbors. We were trimming our yards for the holiday, each helping the other. We represented a variety of age groups, nationalities, races, occupations, income levels. We were the poster group for the old-fashioned term, melting pot. I felt enriched. I’ve often thought that the best part of being an American was being heir to all countries, languages, cultures, and religions. I label myself with a new hyphenated term. I am an enriched-American. P.S. 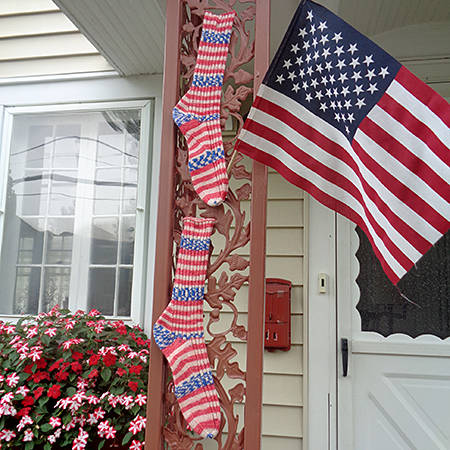 My neighbors also liked the holiday socks that I hand knit last weekend. P.P.S. I listen to audiobooks while I knit and found this one stunning. David McCullough is one of my favorites, both as a writer and a narrator. This book captures the brilliance of Orville and Wilbur, and the world-changing nature of their achievements. When I was in Dayton to teach a knitting workshop, a friend took me on a tour of the city. We saw the Wright homes, the sites of the Wright printing company and bike shop, Paul Dunbar’s home, and the place where the brothers tested their planes. McCullough captures it all in this book. Reading it is time well spent. Flowers are a gift of grace. What I know about gardening would barely fill a thimble so any flower that blooms in my gardens is a gift and not a result of my tending. If this photo had been taken closer, weeds would show to prove my point. 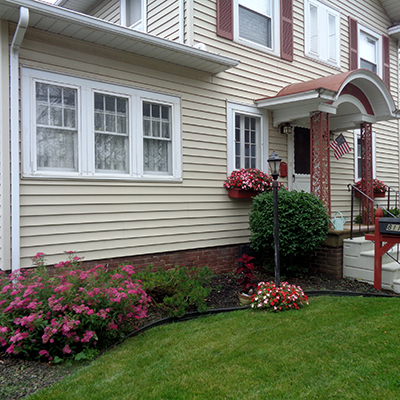 When a foot of snow was piled over these window boxes and lawn, I rested on my shovel and imagined this scene. The anticipation of enjoying the warmth and the color was almost as much a gift as the flowers.